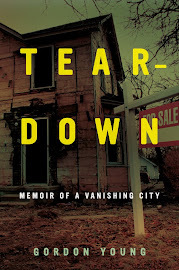 I just read your book Teardown, and as a result checked out your Flint Expats blog. I thoroughly enjoyed both. I have a loose connection to Flint. I was born and raised in Chicago. But, from 1987-1989 my older brother played hockey for the Flint Spirits. I was around 9-10 at the time and I thought driving to Flint from Chicago when my dad got off work on a Friday to catch a game was the coolest thing. The rink and the team had the feel of "Slapshot," a great movie. I attached a picture of a practice jersey I still have from the 1989 team. I believe my brother stole it from the goalie and gave it to me. I occasionally wear it in some old men's hockey leagues around Chicago. About ten years ago I was wearing it and made a friend with a Flint expat. He was extremely excited to talk to anyone who knew anything about Flint. Mel Hewitt discussion from the Hockey Fights Database Discussion Forum. Yes, you read that right. "i read another cool interview with him and i got a laugh because in the interview Daryl was asked who the "craziest" guy he ever faced or played against (at least that was the spirit of the question) and Daryl said without hesitation "Mel Hewitt" and that made me laugh....Mel played with Daryl for a year in Maine in 1982 and keep in mind this was the year Dave Brown was in Maine racking up over 400 PIM.....to make a long story short Daryl referenced a night they were in the bar and Mel got in a fight with Bill Goldthrope (slapshot's Ogie Oglethorpe character) and Mel proceeded to brake a beer bottle over Bill's head this made me laugh because Mel and i graduated high school together and he was the toughest (scarriest) guy i ever met....he was 5'11 190 but built like a lean body builder (gentics) and when we were in grade 12 they brought Mel up to the Saskatoon Blades to add team toughness....Mel loved to fight....i know when they went into New West he said he was going to challange them all....now this was when New West was scarrier than the spectrum during the broad street bullies era.....now here's Mel a fraction of the size of Beck Maxwell and a host of the other fighters....long and short of it is Mel went into New West and got in three fights in the first game....he racked up 75 minutes in penaties in the playoff that spring and he always had black eyes and a big smile on his face....he would always tell me how much he was looking forward to fighting Fraser (victoria) Beck, Maxwell.....he would just laugh....now keep in mind they were all older and bigger than Mel he was an amazing street fighter and really crazy....he was more of a middle weight in hockey fighting sense but might be compared in many ways to Randy Holt ....i know he got over 500 PIM's in Saginaw one year." I remember Mel Hewitt playing for Flint and Saginaw in the old IHL. These teams HATED each other. No more then we The Saginaw Gears moved and the Flint Generals moved to Saginaw and took the name Generals with them. The Spirits were born and created one of the best rivalries in minor league sports. We were only 45 min apart and fans hated each other. We all knew each other because both teams fans traveled to away games. I remember several unfriendly situations in the opponents parking lots. Fun times!